I’m writing this story with a with a bit of fear and trepidation. It’s because I’m so close to the story and there’s a lot of love and emotion involved in the telling of it. Yet I feel like I must share this in order to honor a fallen brother, who was a comrade in arms, who ran his race well and finished it in full course with full honors. Don Stevens was a friend, a man of God, man full of love and grace, love for the Lord and the love of his life, Ruth with whom he had full marriage of 60 ½ years. When I met Don and Ruth I was working in apostolic fashion with the leadership of a church in Garden City, Idaho, which is in the Treasure Valley of Idaho. I come from a city called the Garden City which is in the state known as the Treasure State. We always felt there was a connection that was of the Lord. When I met Don and Ruth for the first time they had recently returned from the mission field in Ecuador where they had served faithfully for a number of years. As often is with true missionaries, they served faithfully and were loyal to the Lord in all ways. They had originally been sent by their church, but after arriving and serving for a short period of time the church reneged on their commitment of support. Yet Don and Ruth continued to serve faithfully for all the years that the Lord had called them to serve. The Lord provided. When we met first, in Idaho, we had an affinity for one another immediately. I’ve always had a heart for bond servants, true missionaries who serve the Lord selflessly. As we got to know one another I found out he was a fellow hunter and enjoy the outdoors as I do. He found that I had a combination rifle that I was selling. This is the type of rifle which has both rifle and a shotgun barrel. They’re not well known in North America but those who know them often enjoy them. Don said he’d always wanted a rifle like that but never got one. As I mentioned I’ve always had a heart for those that serve the Lord, so on my next trip down to Idaho I brought that rifle and gave it to him as a gift. I know it touched his heart. There came a time when I needed to ask Don to serve the Lord in order to help His church. It became necessary for me to bring in new leadership into a church I was working with there, until such time as we could raise up new leadership from within the congregation. I asked Don, who had pastored before, if he would come on board as the pastor for the time necessary. He prayed about it and, although I know he was hesitant to take on the duties, he accepted the call. Because he was willing to do that we were able in due time to raise up leaders from within the congregation to pass leadership of the church on to. Don was a faithful friend, and a travel companion with me in ministry. I was on a recent ministry in India when I received word about Don’s passing. Don was well loved among the believers in India. I recall a story he told when he accompanied me on his first trip to India. He shared with the congregation there how he had a dream when he was a 12-year-old boy – he saw many people especially the women were dressed in bright colorful clothing. He noticed many of them had a dot or a mark in their fore head. Although he had been in ministry for many years, even in other nations it wasn’t until he stepped off the plane in India that he saw that vision fulfilled with his own eyes. We had a great time there not just once but twice as he accompanied me a second time to India. As was the case in Ecuador and in the United States the believers in India loved him like an elder brother and like a father. I always felt it ironic, and yet an honor, that Don would introduced me as his spiritual father, even though he was many years my senior in natural years. Don was faithful his entire life, was an example of one who was obedient even when it was necessary to sacrifice in order to be obedient. There came a time when I asked Don if I could take him out bird hunting. He came along with another friend of mine and a good hunting dog to point the birds for us. When the dog first went on point my friend and I stood back and let Don take the shot. He made a great shot on a chukar partridge which are always a blessing to take to bag, as they are not necessarily easy to hunt. As the dog retrieved the partridge for him, I felt like the Lord wanted me to lay hands on Don and bless him, which I did. I prayed over him and the Lord granted a prophetic word. Part of that word was the Lord expressing to Don, His son, His pleasure with Don’s faithfulness. The Lord said that He had extended Don’s life because of his obedience, and he had more for him to do because he could trust him. 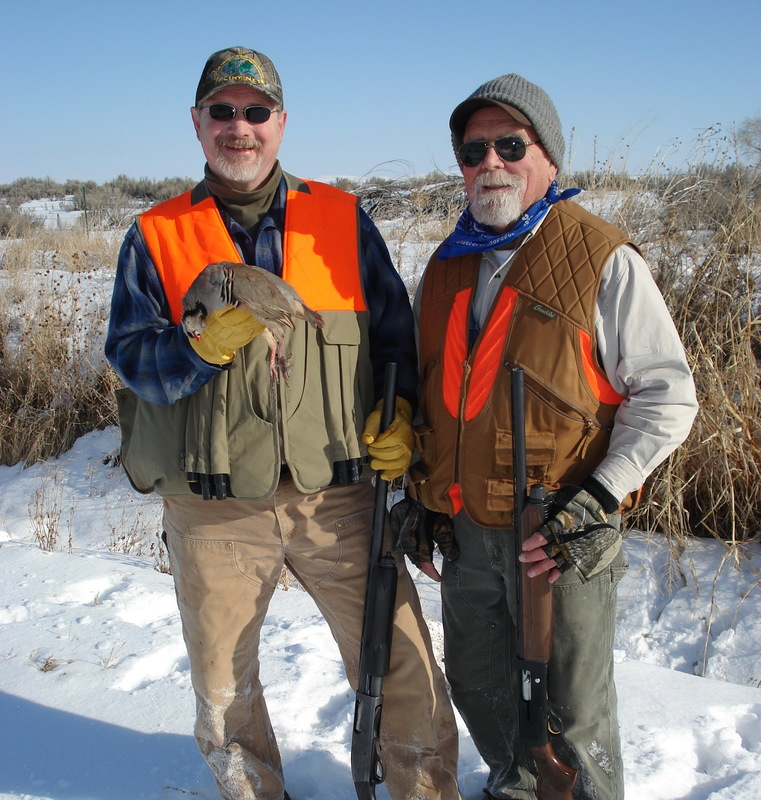 Don continued to tell us that this was the first time he had been back out hunting since that day when he had the heart attack. And so it also was a spiritual assignment to him, being asked to come out on that fifth anniversary, knowing that five is the number for grace, and then having the prophetic word with the Lord reemphasize to him that he was still on the earth because he had obeyed. Needless to say all three of us were touched by the hand and grace of God. Don was like that, willing to serve, not looking for accolades, not looking for attention. But faith and obedience brings us to the attention of God Almighty. Don said, had he died on that day, he never would’ve seen that vision of all those people in those bright dresses and bright clothing with the dots on her forehead come to pass. Because our trips to India occurred after he accepted the call to serve in that church until we could raise up new leadership. Don continued to serve the Lord for many years and recently he went on to be with Ruth who preceded him into the presence of the Lord. He was 85 at the time of his passing. I know Don has a full reward, and I also know that there’s much fruit on this earth which is held in his heavenly account. We might never know the things that the Lord will ask us to do for Him. Often He’ll ask us to do things which are not comfortable for us, things that we might not volunteer to do unless duty and the Lord require us to do it. Yet it is in accepting the call that we often see our promises fulfilled. Often the promises of God, are not fulfilled in the way we think, and often they must be laid down in order to accept challenges and duties which do not seem central to fulfilling the promises we have received. And so it is, that as we lay down our lives in service, we often pick up the promises of God along the way. I don’t know how God works, but he is always working for our benefit and for the benefit of His plans and purposes. What is good for His strategy, is good for us even when we don’t know it. And often the Lord rewards us in ways we may never know. Don and I often served as a team, and we loved one another. I never thought I would join in his rewards. But since his passing a short time ago, I have been asked by a Bible school in Ecuador to teach to their Masters students, which I have agreed to do. I never thought I would be sowing into the church in Ecuador, but perhaps Don is overseeing some of the work that he started so long ago through my willingness to accept a call I didn’t expect. In all my years serving the Lord I have tried to rely upon Him not on my own wisdom. By His mercy and grace, I don’t say that is a cliché, I’ve been able to accomplish things that He asked me to do. Often things that are beyond my own capability or ability. I’ve learned that where I’m not capable, yet called, the Lord will grant grace to accomplish with Him what I could never accomplish in my own effort. I’ve also learned that often when we come together in unity, Koinania Fellowship, the Lord can accomplish things with willing vessels, that man could never have dreamed of. Don’s legacy will continue on long after his earthly life has passed, as worthy as it was. That is the way of the Lord. When we plant seeds in obedience with faith, even without understanding, the Lord who is the Master Builder and the great Husbandman, will raise up spiritual fruit which will have generational impact.